Seventh and last stop of our Bohol Countryside Tour, Day 2 in Bohol (January 29 - 31, 2010). My husband strikes a pose with his "compadres." 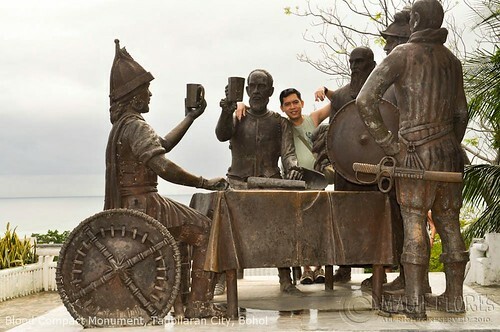 On March 15, 1565, a blood compact was made between the Boholano chief Datu Sikatuna and Spanish expedition leader Miguel Lopez de Legazpi. The two leaders were believed to have made a cut in their arms, collected a few drops of their blood, and mixed it with the wine they drank. The event is known from then on as Sandugo which means "one blood in the Boholano dialect. The Blood Compact Shrine now stands on the very spot where the blood compact was done. We reached the monument as part of our Bohol Countryside Tour. It was the last stop as it is the one nearest the city proper. Other than the monument where visitors can take souvenir pictures, there is no other place of interest surrounding the site. There are a few souvenir shops along the highway but it was still a little more expensive than the treats we bought at the Tarsier Visitors Center. The Sandugo Festival is held every March in Bohol in honor of this historical rite of friendship. Hundreds of people from in and around the Philippines visit Bohol to watch street parades, beauty pageants, and other activities. The Blood Compact Shrine is in Barangay Bool, Tagbilaran City. 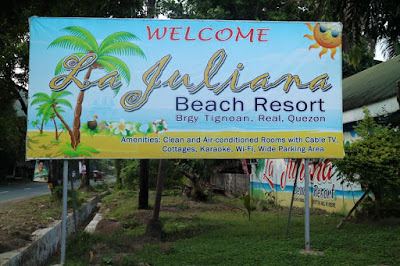 To go there, you can ride a tricycle or a cab from the city proper. I would recommend hiring a van for the whole day and visiting the Blood Compact Shrine as part of a tour. The van drivers also act as tour guides. 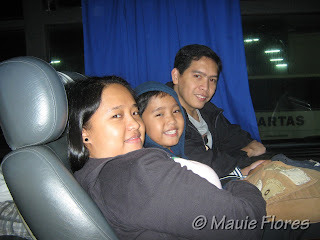 Our 8-hour countryside road trip cost us Php 3,500 pesos.